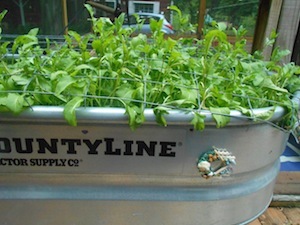 In a matter of a couple of weeks, my arugula went from green specks to a forest of leaves shooting above the galvanized tin livestock feed tub I used this year as a planter. The central shoots were developing buds. I needed to use them before they went to seed. I probably have five or six gallons of arugula waving in the breeze on the back deck. I love my handy greens garden. The oval feed trough we bought at a farm tractor store is just the right size for a back-deck container crop. We punched holes in the bottom with a nail for drainage and put the tub on a sturdy little redwood table at thigh height. Perfect. I adore the peppery bite of arugula, so using the first crop of the season would be no problem. Or so I thought. When a couple of salads and casual grazing put barely a dent in the thick patch, I thought in earnest of ways to use a lot of arugula in a hurry. 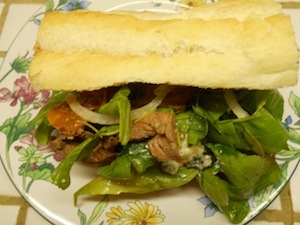 The recipe I came up with, steak salad sandwiches, uses four cups of arugula leaves. I tossed them with vinaigrette and about a half pound of thin-sliced, pan-grilled top sirloin steak, chopped fresh herbs, thin-sliced sweet onion, sun-dried tomatoes and crumbled blue cheese. The salad lushly filled four 4-inch lengths of crisp baguette that I had partially hollowed out. Two sandwiches were perfect for Tony for dinner. I was satisfied with one. These sandwiches are a semi-elegant, flavor-packed way to make a little steak go a long way. With some fresh fruit, they would make a lovely picnic. Wrap each sandwich in parchment and refrigerate before serving. The sandwiches used up only a fourth of my supply of arugula, so I’d better get grazing. By the way, if you grow arugula – and you should, because it grows like wildfire – use scissors to harvest the outer leaves of each plant, at the base of the stems. Do not allow the plant to flower. The leaves will grow back for continued harvesting. Heat a heavy skillet over high heat. Do not add oil. Season steak well on both sides with salt and pepper. When the skillet is very hot, add steak and cook for two minutes. Turn steak, reduce heat to medium-low and continue cooking until medium rare or desired doneness. Meanwhile, toss arugula in a bowl with the herbs and onion. When steak is done, cut into thin strips. Add vinaigrette to arugula mixture and toss very well to coat every leaf. You’ll think one tablespoon isn’t enough, but if you keep tossing, you’ll see it is. Add sea salt and pepper to taste. Add steak, sun-dried tomatoes and crumbled blue cheese. Toss to distribute ingredients. Cut each length of baguette in half horizontally. Pluck crumbs of bread from the interior of the baguette rolls with your fingers to measure about 1 tablespoon per roll. Discard crumbs. Fill each roll with one-fourth of the steak salad. Serve immediately or wrap sandwiches in parchment paper. Makes 4 sandwiches. Note: An all-purpose vinaigrette may be made by combining one-half cup olive oil, one-fourth cup red or white wine vinegar, one-half teaspoon Dijon mustard and salt and pepper in a lidded jar and shaking well. Store leftovers in refrigerator. The fresh greens, radishes and herbs of early-June farmers’ markets are so welcome after a winter and extended spring of root vegetables and stews. I watch in wonder as my buckeye tree shoots out its glorious bottle-brush flowers, amazed again by the earth’s awakening. The older I get the more surprised I am when winter ends. This year I half expected the landscape to remain cold, brown and dead. So I may even do a little dance when I cook at my first farmers’ market of the season. I am so happy to see blue sky and green grass, let alone basil and sugar-snap peas. I will be cooking and sampling from 4 to 6 p.m. Thursday (June 4) at the grand opening of the Copley Creekside Farmers’ Market just north of Copley Circle on Cleveland-Massillon Road. Get out of the house. Come join the dance. Please e-mail this newsletter to someone you think would enjoy it. I run into former Beacon Journal fans all the time who are surprised to hear that I’m still writing. My West Point Market favorite was their “other” spread. It is a cream cheese based cheese spread that I think contains butter and a lot of garlic – and probably a host of other ingredients. I have never found anything that closely resembles the taste of it. Any chance you or your readers have the recipe so we don’t have to live without it once WPM closes its doors? Dear Tami: After that nice compliment I’m sorry to tell you I don’t have the recipe and I don’t trust myself with all the butter and cheese it would take to recreate it. Has someone else found a close substitute? If so, please share.